Nothing can arrest the tranquil turbulence of passing seconds, minutes, hours, days, months and years. Suddenly you are 60 years old, or maybe 59 and 3/4, the departure lounge beckons, but is hopefully situated far far away, at the end of a long corridor….but you can’t see that far anyway. Simultaneously in denial and acceptance, you are doing your very best to keep in shape physically and mentally. This means a good diet, plenty of healthy exercise and beating your 89 year old mum at Scrabble. (Tip:….let her win on her birthday). You need an endeavour to defy the patience of the god of inevitability. For cyclists, there are many such challenges from which to choose. This group comprised Old Grey Socks, Faustino S, Ironmortal and The Wattmeister with an aggregate age of precisely 240. 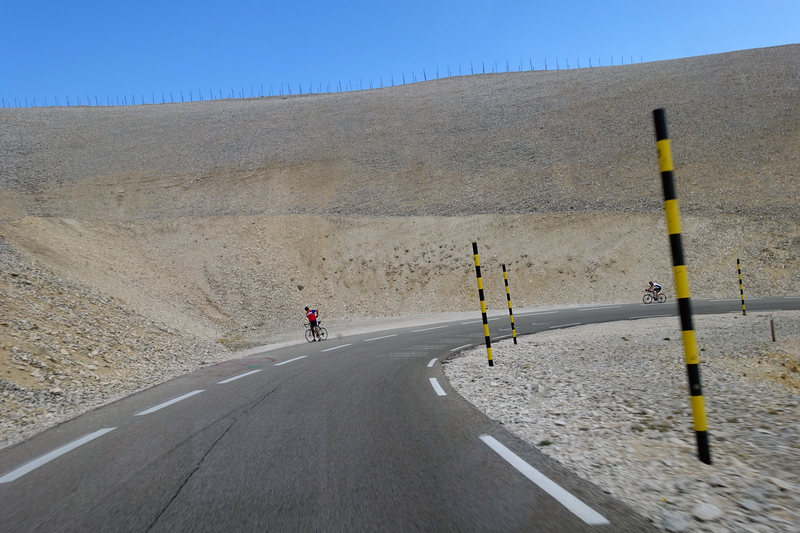 We chose to ride up The Giant of Provence, Mont Ventoux, on each of the three tarmacked roads which lead to its omniscient summit at 1912m above sea level. This is the equivalent to cycling halfway up Mount Everest in a day, 4400 metres of ascent. The ride totals 140 kilometres in length, half of which is downhill. I won’t bore you with the unimportant details of this ride, but we left Bedoin in sunshine at approximately 07.15 on Saturday morning, 2nd June 2018 ….and we finished at approximately 18.00 on Saturday afternoon, 2nd June 2018, having encountered some rain and fog, but mercifully none of the strong winds for which this mountain is well known. I don’t wish to skip over the suffering, but at one point on the murderous ascent from Malaucene, The Wattmeister spied a cyclist who had chosen to rest his legs by walking up the 13% incline. Cranking up his own speed to a thunderous 6 kms per hour, The Wattmeister proceeded to attempt to reel in the temporary pedestrian…..it took forever….that red jersey never seemed to be getting any closer….could it be possible that tramping, pushing a bike, was faster than cycling? Somehow, The Wattmeister winched his way past the octogenarian hiker, who, to his great credit, was giving his own two fingered salute to the departure lounge. The overwhelming effort caused a flood of sun cream immersed sweat to cascade into his eyes, momentarily blinding him, all the while under siege from a plague of vicious man-eating flies. Fun it was not….. the end never felt closer. Nevertheless, the challenge was met, and the final ascent from the beautifully appointed town of Sault took us up gentle wooded slopes on the north east side of the massif, the paved surface steaming mystically after a passing thunderstorm. 2 bananas, 2 gels. baguette of jambon et fromage, shared spaghetti bolognese, two coca colas, 3 x 750ml bottles of water, a bag of nuts magicked up from somewhere, 1 x giant pizza in Phil’s Bedoin washed down by a couple of beers. The proprietor shook our hands and congratulated us, which was rather touching.